Citoyen du Monde, the park's spring Broadway Billboard by Beninese artist Meschac Gaba, is the artist's vision for a global flag. 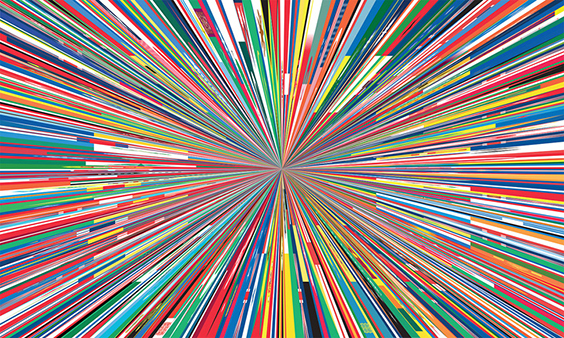 Created by elongating individual flags from every country in the world into narrow triangles that converge at a central point, this optically spectacular work presents an image of idealism and humor for resolution of the difficulties and crises that divide our world. The singularity of each flag is lost in the rhythm of the composition as is the case in the age of globalization where national borders merge into the international. Meschac Gaba was born in 1961 in Cotonou, Benin. He lives and works between Cotonou and Rotterdam. He studied at the Rijksakademie voor Beeldende Kunsten in Amsterdam in 1996-7, and currently lives in Rotterdam. It was at the Rijksmuseum, Leiden, in 1997 that Gaba inaugurated his major work, the Museum of Contemporary African Art, a project in which the artist installed 12 'rooms' of a nomadic museum in various institutions over a period of five years, culminating with his presentation of a 'Humanist Space' at Documenta 11. His Tresses series has showed at inIVA in London (2006) and the Studio Museum in Harlem, New York (2005). Other solo shows include Glue Me Peace at the Nobel Peace Center, Oslo (2006), and Tate Modern, London (2005). Bio excerpt from Stevenson.info. Citoyen Du Monde is Courtesy of the artist, Stevenson, Cape Town and Johannesburg and Tanya Bonakdar Gallery, New York.